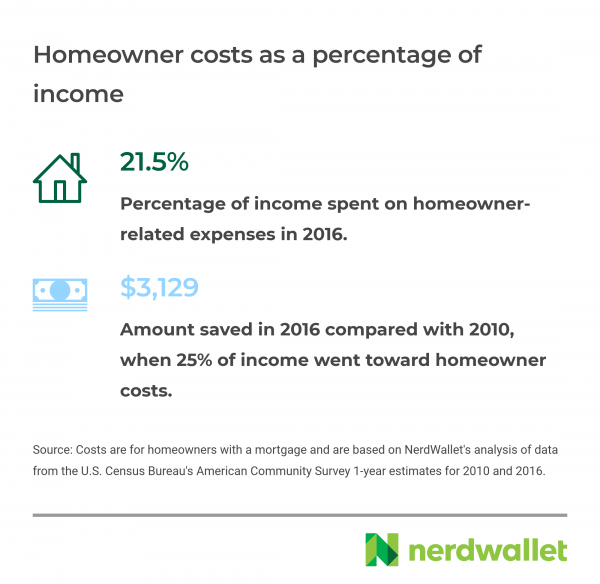 NerdWallet's analysis found that owning is taking a smaller bite out of paychecks and fewer mortgages are delinquent, but Americans are still worried about covering unexpected costs. Many of the nation’s 75 million homeowners have a lot to feel good about — housing costs are consuming a smaller part of their paychecks, and fewer are behind on their mortgages. Across the generations, homeownership is providing not just a roof over our heads, but also a sense of accomplishment and pride. Still, owning a home isn’t easy, and it comes with financial and emotional costs. Many Americans say it’s expensive to have a home, and many more have experienced anxiety about their house. These are some of the highlights from a new report by NerdWallet, which took the pulse of homeowners by examining recent homeownership data and commissioning an online survey, conducted by The Harris Poll, of 2,036 U.S. adults in March. If recessions, high prices and stress can’t kill the American dream, I’m not sure anything will. The American desire to own a home is incredibly resilient. Homeownership costs are taking a smaller bite out of paychecks. Americans with a mortgage spent 21.5% of their incomes on homeownership costs in 2016, the lowest rate since 2010, when they were spending 25%, according to U.S. Census Bureau data. Americans say their homes are costly. Nearly one-third (30%) of homeowners say their monthly housing costs are expensive, according to the survey. Homeownership causes anxiety. 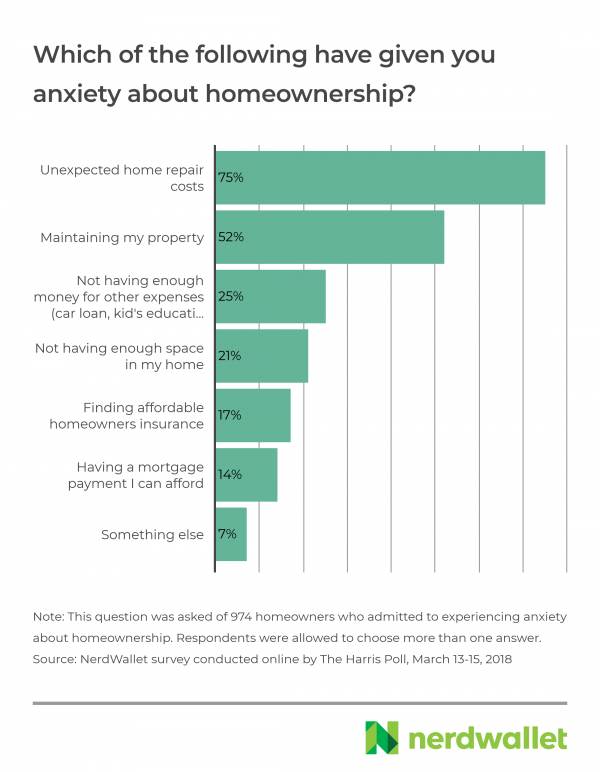 Nearly two-thirds (65%) of homeowners have experienced anxiety related to their home, and 75% of those anxious homeowners said unexpected home repair costs were the cause. Mortgage delinquencies are down. Mortgage delinquency rates are the lowest they’ve been since the foreclosure crisis, according to data from the Consumer Financial Protection Bureau. Still, 11% of homeowners with a mortgage made one or more late mortgage payments within the past 12 months, according to the survey. Late payments could cost U.S. homeowners over $500 million each year. 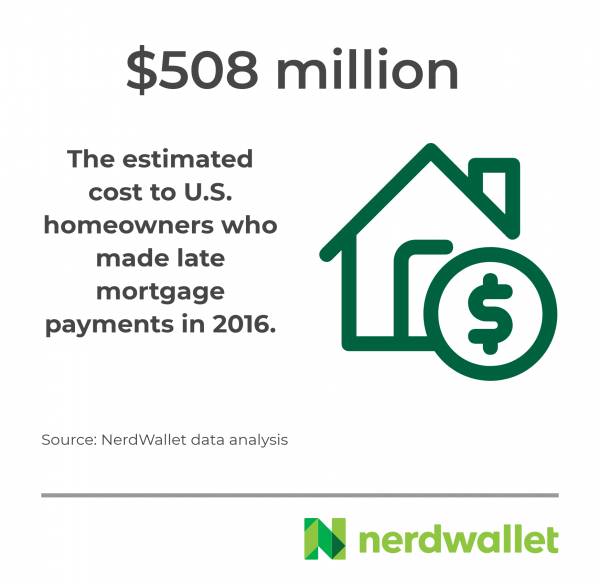 Homeowners 30 to 89 days late on their mortgage may have been billed up to $508 million in late fees in 2016, according to NerdWallet’s analysis. Homeownership feels (mostly) good. Many homeowners have positive feelings about their status: 40% believe they’re more financially stable after buying their home than they were before, 58% say owning a home makes them feel accomplished and 54% say it makes them proud. Homeowners report paying $1,443, on average, each month on housing costs such as their mortgage, homeowners insurance, property taxes and homeowner association dues, according to the survey. Almost 1 in 3 (30%) call these monthly costs expensive. From 2008 to 2010, when homeowners were feeling the effects of the Great Recession, homeowners nationwide were spending 25% of their income on the costs associated with homeownership, according to census data. That number began falling in 2011. In 2016, the last year for which the data are available, the homeownership bite out of income dropped to 21.5%. To put that in perspective: If homeowners with a mortgage were still seeing 25% of their income go to ownership costs in 2016, they would pay $21,815 — or $3,129 more than the 21.5% they actually paid in that year, according to census data. To see how monthly homeownership costs vary from state to state, click here. There’s a chance homeowners could be saving even more. Some 40% of homeowners don’t know how much their current homeowners insurance premium is, according to the survey. This premium is typically included — and sometimes overlooked — in a monthly mortgage payment. Homeowners should get into the habit of conducting a yearly audit of their mortgage costs. And there are other ways to save on the costs of having a home. “Homeowners should be cognizant of current mortgage rates and how much of their loan they have paid off to see if a refinance makes financial sense,” Manni says. Lenders are legally obligated to cancel private mortgage insurance when the amount left on your loan reaches 78% of your home’s value, but you can request they cancel it earlier when it reaches 80%. Meanwhile, people who rent estimate that they pay $1,258 on associated monthly costs, such as utilities, rent and renters insurance, according to our survey. Over a third of renters (36%) say these monthly costs are expensive. Indeed, spending on rental costs increased 6.1% from 2015 to 2016, according to data from the Bureau of Labor Statistics. Compared with data that show a 1.4% increase in spending on homeownership costs during that same period, it’s clear why renters are more likely to report their housing costs as expensive. Nearly two-thirds of homeowners (65%) have experienced anxiety related to owning their home. The top cause of this anxiety: 75% say it was dealing with unexpected home repair costs. Women were considerably more likely than men to report feeling anxiety about being a homeowner (70% vs. 59%). One option for some homeowners hit with home improvement and repair costs: a home equity line of credit, or HELOC. Like a home equity loan, a HELOC requires homeowners have sufficient equity, or value, in their home. They can use a home equity calculator to determine value. However, unlike a home equity loan, which delivers money in a lump sum, HELOC funds are available for owners to tap, in whole or in part, as needed. More than a quarter (27%) of homeowners have opened a home equity line of credit. Among them, 25% haven’t used it, according to a different NerdWallet survey conducted online by The Harris Poll in March. The top reason for opening a HELOC was to pay for home repairs/improvements (63%). » CALCULATOR: Which financing option is right for your home improvement? Some 8% of homeowners with a mortgage made one to two late housing payments within the past 12 months, compared with 17% of tenants with a rent payment. And 13% of homeowners who have bought a home say they’re less financially stable after buying than they were before purchasing a home; 40% say they’re more financially stable. Overall, however, mortgage delinquency rates are at the lowest since the foreclosure crisis, according to data from the CFPB. The 30-to-89-day mortgage delinquency rate, as published by the CFPB, is an early indicator of mortgage distress. It would capture some homeowners who said that they had one to two late payments as reported by their lenders to a credit agency within the past year. That rate hit a U.S. monthly average of 3.9% in 2009. In 2016, the last full year for which data are available, the 30-to-89-day delinquency rate was 2.2%, on average. Ninety-day delinquencies, on the other hand, are more serious and represent homeowners who are at greater risk of foreclosure. In 2016, the number of mortgages 90 days or more delinquent in any given month was 1.4%, on average, compared with about 4% of mortgages from 2009 through 2012. For state by state delinquency rate data, click here. Despite lower delinquency rates in recent years, homeowners 30 to 89 days late on their mortgage may have been billed up to $508 million in late fees in 2016. This delinquency cost estimate assumes homeowners were charged 5% for their late payment — a roughly $40 fee that doesn’t seem like much for one homeowner. However, when you apply this to the number of homes in delinquency, the penalties add up. For homeowners who aren’t struggling, a $40 penalty seems manageable, but if you can’t cover your mortgage, fees levied on top of late payments make it even more difficult to pay. 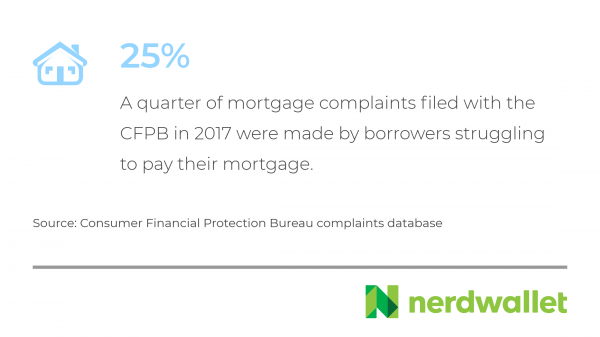 CFPB data indicate that 25% of all mortgage complaints they received in 2017 were from homeowners “struggling to pay mortgage,” which is one of 19 mortgage complaint categories. In general, few homeowners identify with a list of common regrets when it comes to their home. Younger homeowners are slightly more apt to identify with some of these regrets than older owners, according to the survey. Buying a fixer-upper is the top regret (8%). Despite 65% of homeowners having experienced anxiety about owning, more than half of say they feel accomplished (58%) and proud (54%) of their homeowner status. These feelings align with the findings from NerdWallet’s 2018 Home Buyer Report, which found 75% of Americans believe buying a home is a priority. The homeownership survey of 2,036 U.S. adults ages 18 and older was conducted online by The Harris Poll on behalf of NerdWallet from March 13-15, 2018. Of those surveyed, 1,448 were homeowners and 554 were renters. The HELOC survey of 2,043 U.S. adults ages 18 and older was conducted online by The Harris Poll on behalf of NerdWallet from March 6-8, 2018. Of those survey, 1,490 were homeowners. Both online surveys aren’t based on a probability sample and therefore no estimate of theoretical sampling error can be calculated. For complete survey methodology, including weighting variables and subgroup sample sizes, contact Maitri Jani at mjani@nerdwallet.com. Homeowner costs as a percent of income were based on data from the U.S. Census Bureau American Community Survey, 1-year estimates, 2010 and 2016. Data included median household income of housing units with a mortgage and selected monthly owner costs as a percentage of household income. Data of the costs of rented and owned homes in 2015 and 2016 are from the Bureau of Labor Statistics Consumer Expenditure Survey. 2017 mortgage complaint data was retrieved from the CFPB’s database on Jan. 17, 2018.